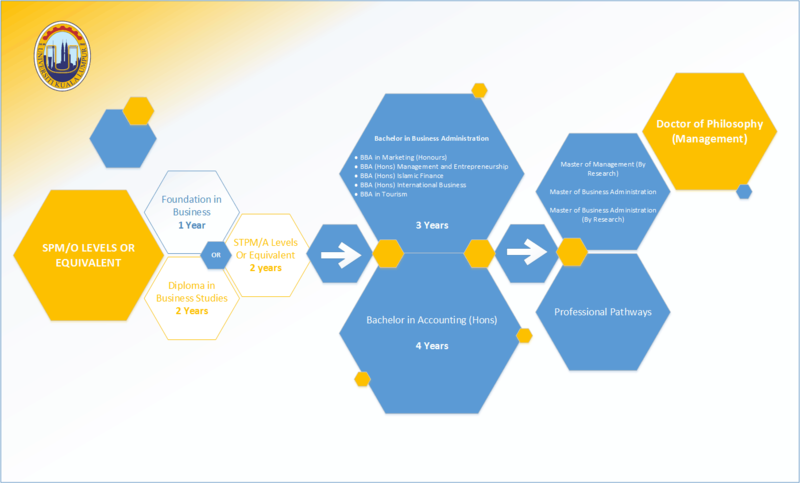 Foundation in Business (FIB) is a 12 months programme specially designed to give you a focused route in Marketing, Accounting, Islamic Finance, Tourism, International Business, Management and Entrepreneurship so you will be ready to higher education in those fields at Universiti Kuala Lumpur Business School (UniKL Business School). The programme is a combination of academic skills, content specific modules, practical hands-on teaching approaches as well as providing guidance in challenging work on critical thinking, academic literacy and communication skills. The emphasis on academic literacy and communication skills will enable you to express complex ideas in a concise and appropriate manner. The Foundation in Business programme will introduce you to the learning style that best prepares you for degree level studies with lectures, tutorials and seminars. learn to work effectively in groups, introduction to conduct research and deliver good presentations. Successful completion of the Foundation programme enables entry to the first year of your undergraduate degree at UniKL Business School. Our experienced academic staff are not only teaching professionals but are also the point of contact to the student support system. You will be introduced to a member of the teaching team right from day one who will be your academic advisor and will be able to provide general guidance and support. UniKL Business School are well equipped with excellent on-campus facilities and academically qualified and industry trained academic staff who will guide you in keeping abreast with current practices of the business world. The learning opportunities and experiences we offer will add value to your understanding and develop both your academic and life skills. Eventually, you will graduate with a host of practical, social, managerial, and entrepreneurial skills alongside core business skills. The programme content is taught over two semesters through lectures, seminars and tutorials. All the subjects taught are designed to directly relate to the progression degrees offered of your choice. The medium of communication will be in English, thus you will learn the language effectively to perform a variety of academic tasks, such as delivering presentations, managing group discussions, conducting research, and writing reports or term papers. Minimum 5 credits (C’s), in SPM or O-Levels, including English and Mathematics or other relevant subjects - or equivalent global qualifications.